Great Answers to the Top 10 Most Important Interview Questions! When it comes to answering common interview questions, preparationInterviewsAce your next interview! Check out CFI's interview guides with the most common questions and best answers for any corporate finance job position. Interview questions and answer for finance, accounting, investment banking, equity research, commercial banking, FP&A, more! Free guides and practice to ace your interview makes all the difference and clearly separates good from bad candidates. This guide will help you prepare for an upcoming interview by placing you in the seat of the interviewer (hiring manager) and helping you see things from their perspective. After you’ve read all the common interview questions and answers in this guide, write down your own answers and practice reading them aloud. Then, have friends and family ask you the questions so you can practice repeating the answers back to them. If you want to take your preparation to the next level, consider recording yourself with a phone or webcam so you can see your body language and facial expressions as you answer the common interview questions. Here is a list of the top 10 most important interview questions (not considering any industry in particular). This is very common among first interview questions. The key is to tell a story that explains how you got to where you are today and why it’s a logical next step for you to take this role. It’s important to explain your career in a way that’s interesting, coherent, and shows progression. Avoid a long rambling story with too much detail, but don’t just gloss over things either. It’s important to strike the right balance. Depending on the type of role you’re applying for, you’ll need to adjust the style and approach (e.g., administration vs managementCorporate StructureCorporate structure refers to the organization of different departments or business units within a company. Depending on a company’s goals and the industry which it operates in, corporate structure can differ significantly between companies. Each of the departments usually performs a specialized function). Hiring manager’s view: Does it make sense for you to be in this role and how qualified are you? #2 Why did you apply for this role? What excited you? Some version of this question is almost guaranteed to be asked and it’s one of the few interview questions that can immediately exclude you if not answered well. It’s surprising how many people say something like “I just need a job” or “eventually I want to go back to school and be a lawyer but this job would be ok until then.” While the honesty is probably appreciated, these types of answers will probably disqualify you. You need to show the interviewer that you understand what the job entails and that certain aspects of it excite you and match your skills and experience. Hiring manager’s view: Do you know what the job entails and would you enjoy doing it? #3 What are your responsibilities in your current position? 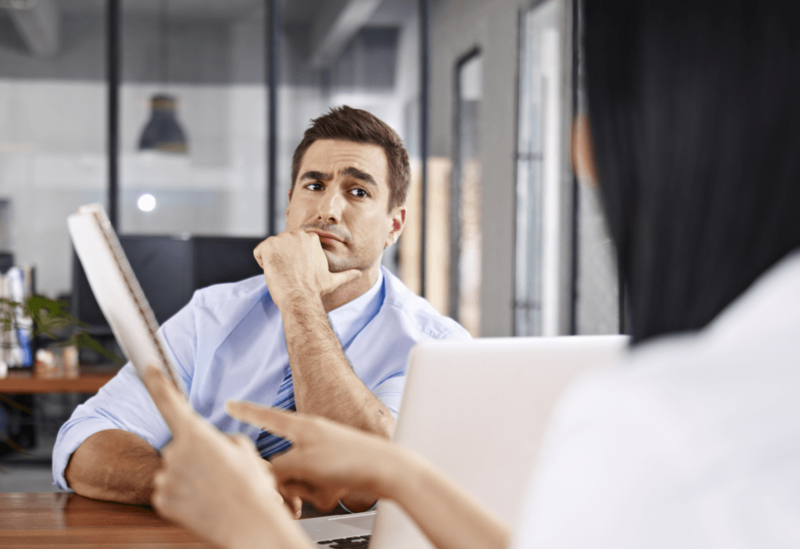 Now the interviewer is digging deeper into your professional experience and wants to know what you’re good at and how well those skills may translate to the job you’re trying to get. Make good use of this opportunity to highlight your skills with specific examples. Instead of just saying you’re good with people, give really specific examples that show how great you are at dealing with people. Hiring manager’s view: What do you actually do in your current job and does it translate to this one? This one of the more open-ended interview questions, as it doesn’t really give you any clear guidance on what direction to go. The key to answering it well is knowing what personality traits the job requires and matching those to your own personal motivations. For example, saying you get satisfaction and energy from helping people would make a lot of sense in a customer service position. Explaining that solving complex problems brings you joy is great for a software engineer or financial analystFinancial Analyst Job DescriptionSee a real Financial Analyst Job Description including all the skills, experience, and education required to be the successful candidate for the job. Perform financial forecasting, reporting, and operational metrics tracking, analyze financial data, create financial models position. Hiring manager’s view: Do you have the right personality type for this job? #5 What are your biggest strengths? Hiring manager’s view: Do you truly have the skills we need for this position? #6 What is one of your biggest weaknesses? This question, by contrast to the one above, is among the harder to answer interview questions. You have to walk a fine line between just issuing yourself a compliment (e.g., “I’m too much of a perfectionist”) and saying something that’s a total deal breaker, like “I get mad at customers sometimes when they ask stupid questions”). In other CFI guides, we’ve discussed the concept of a public speaking weaknessPublic Speaking WeaknessThe "public speaking weakness" answer is a great way to get around the question, "what is your biggest weakness?". If public speaking is not required for the job, then it's a safe answer because it will not really impact your job performance, and yet it's a very common and relatable weakness for most people. This guide as something that a very safe answer here. Hiring manager’s view: Can the candidate come up with something that’s insightful while not being a major problem for us? #7 What are your compensation expectations? Or How much do you currently make? This is another one of the challenging interview questions for any position in any industry. If you’re asked “how much do you currently make,” you have less latitude and should always be truthful. If you’re not happy with your current compensation state what you currently make but add that you believe that’s below market based on your research. If you’re asked what your expectations are, try to point to industry averages or other data points to justify your position. Hiring manager’s view: Do you want more than we can offer? How much do we have to pay you to make you happy? #8 Why should we hire you? This should be answered as a summary of the main points you’ve made so far. Restate what you believe the job requirements are, then provide evidence that you have the skills and the right personality. It’s important to show enthusiasm and conviction that you really are the best candidate (even though you don’t know who the other ones are). Hiring manager’s view: Can you convince me to hire you? #9 What do you like to do outside of work? This is a pure personality fit question. The interviewer is trying to see if you can bond with them by sharing something personal about yourself. There are no clear-cut right or wrong answers. The key is to be honest and demonstrate that you’re passionate about something other than work. Hiring manager’s view: Can I relate to you somehow? #10 Do you have any questions about our company or the job? This usually signals the end of the interview questions and turns the table over to you. Don’t ever say, “No, I don’t have any questions”, unless you’ve already decided you don’t want the job. Good examples of questions include: What are the next steps? What do you like about working at this company? What challenges does the company face? Please describe the company culture in more detail. Why did you post this position / why are you hiring for this role? What are the career development opportunities? Hiring manager’s view: Are you curious, passionate, and truly interested in this job? Read CFI’s list of questions to ask the interviewerQuestions to Ask the InterviewerIn an interview, it’s important to be able to ask the interviewer good questions in addition to providing good answers. Typically, at the end of an interview, the interviewer will ask the candidate if they have any questions for them. This guide will look at examples of good questions to ask the interviewer. Thank you for reading CFI’s guide to help you prepare for the most important and most common interview questions.